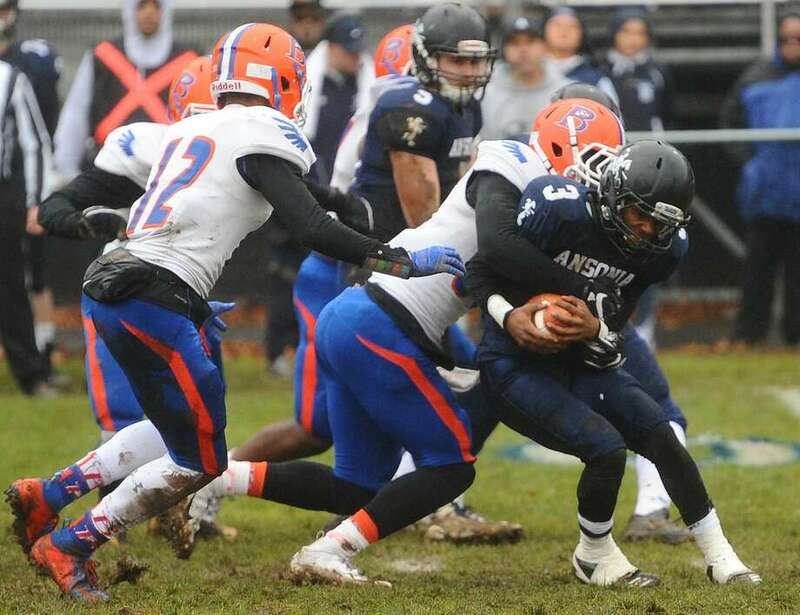 ANSONIA — Bloomfield’s Ky’Juon Butler loves to play old school football. Butler showed why Sunday afternoon. Rushing for 162 yards and scoring a big fourth quarter touchdown, Butler led his fourth-seeded Warhawks to a 26-19 victory over top-seeded Ansonia in the Class S semifinals at Jarvis Stadium. With the win, Bloomfield (11-1) avenges its absence from last year’s postseason and advances to Saturday’s Class S final against seventh-seeded Haddam Killingworth, a 21-14 overtime winner over Stafford/East Windsor/Somers in the day’s other semifinal contest, at a site and time to be announced. The victory also ended Ansonia’s home win streak of 53 games. It was the Chargers’ first playoff home loss since 2000. Bloomfield advances to the Class S final for the first time since 2015 when the Warhawks topped Ansonia. The two teams had met six times in the postseason prior to Sunday’s contest, with each team winning three games. The Warhawks had to escape a frantic final two minutes as Ansonia got within 26-19 when quarterback Sheldon Schuler found a wide open Jalen Johnson in the end zone with 2:01 remaining. After the Chargers (11-1) recovered the onside kick, junior Shykeem Harmon looked as if he would put Ansonia in prime position to even the contest. Harmon ran 45 yards from midfield to the Bloomfield 5-yard line, before he was caught and fumbled. Bloomfield recovered, ran out the clock, and ended Ansonia’s long postseason winning streak at Jarvis Stadium. The Warhawks began the fourth quarter with a 12-6 lead, but watched as Ansonia took its first lead of the game just 30 seconds in. A 9-play, 66-yard drive, which was highlighted by a 26-yard completion from Schuler to Tyler Cafaro, then capped with a 4-yard touchdown run by Harmon. Johnson then kicked the game’s first extra point for a 13-12 advantage. The Warhawks answered immediately. Needing just four plays to march 65 yards, Bloomfield‘s Daron Bryden hit Anthony Simpson for a 35-yard score with 10:41 remaining for an 18-13 lead. Bloomfield responded again with an interception on Ansonia’s next possession, and needed just one play to take a 26-13 lead as Butler ran in from 18 yards out 2:02 later. In what was expected to be a running affair, the game saw three combined touchdown passes in the first 24 minutes as the Warhawks took a 12-6 lead at the half. After holding Ansonia on its opening possession of the game, Bloomfield drove 62 yards in 11 plays, capped with a 26-yard touchdown pass from Bryden to Anthony Simpson with 4:08 left in the opening quarter. Butler ran for 66 yards on five carries in the opening drive. The Warhawks did a nice job to start the contest by bottling up Harmon. With Ansonia’s running game under control at the start, Bloomfield took a 12-0 lead with 9:17 to go in the half by completing a 3-play, 78-yard drive. The key play in the scoring drive was the last one as Bryden hit Jayvon Massey at midfield. Massey was preparing for a hit which never came, before turning and running untouched down the left sideline for Bloomfield’s second touchdown of the opening half. Ansonia answered quickly and the Chargers also went to the air for a score. The Chargers capped a 68-yard scoring drive when Schuler hit John Picheco for a 9-yard score after Tyler Cafaro sparked the offense with opening runs of 21 and 15 yards. The Chargers looked as if they were in good position to even the game or take the lead in the final minute of the opening half, driving to the Bloomfield 17. The Warhawks held, stopping three consecutive Ansonia pass attempts for a score in the final seconds. Ky’Juon Butler – The Bloomfield senior ran for 162 yards and kept the Ansonia offense off the field with several big runs throughout the contest.